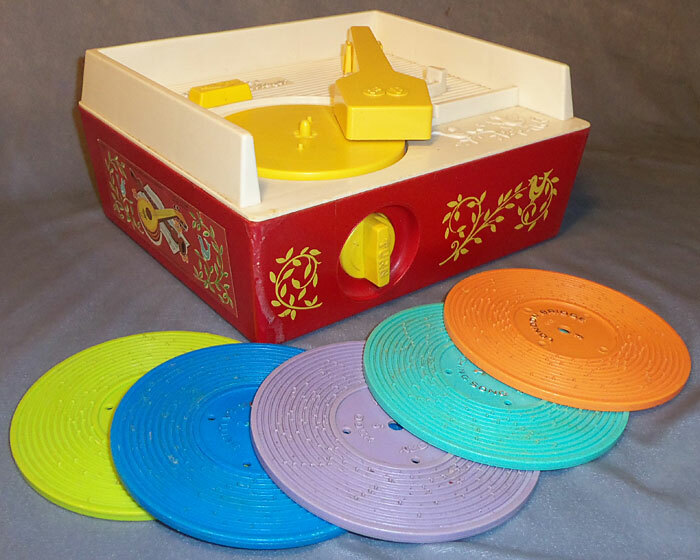 Description: This plastic wind-up music box plays plastic records just like a real phonograph, but requires no batteries! This record player has a hidden compartment that stores the 5 accessory records. Has an attached carry handle makes for easy portability. 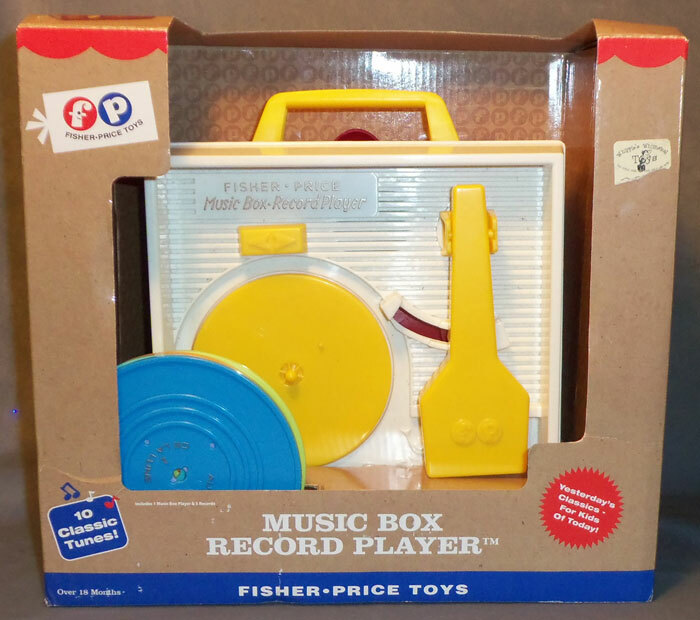 NOTE: In 2010, this Music Box Record Player was re-released as one of the Fisher-Price classic toys. 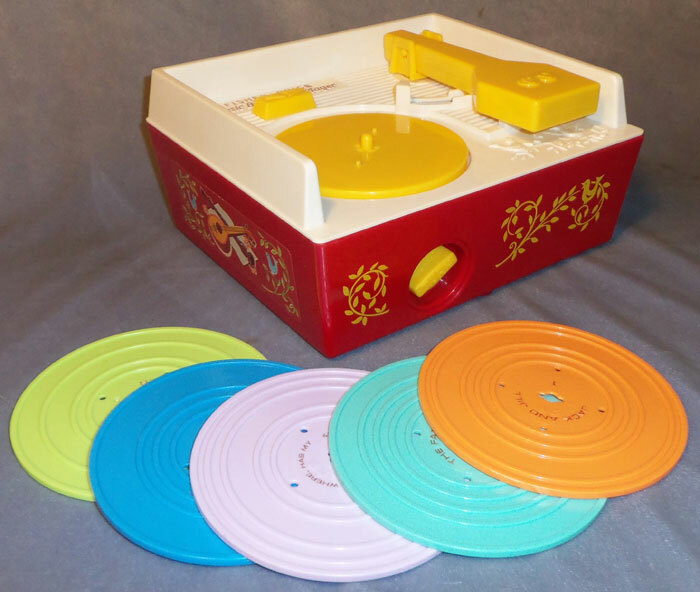 This re-release looks similar to the original #995 Record Player, except the bottom of the player has a battery cover/compartment and requires 3 AA-size batteries to operate. 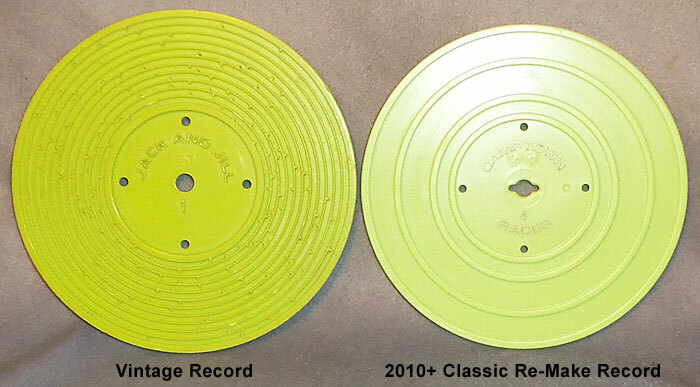 The 5 records sold with the re-release are slightly smaller than the original records, and they are NOT interchangeable (old records will not play on new record players and vise versa). 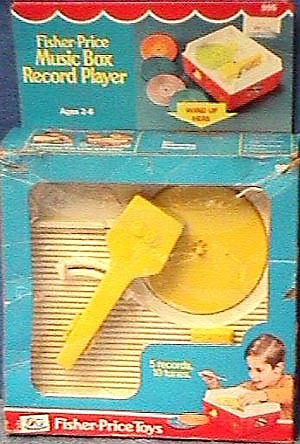 Red plastic record player with a white top, yellow turn table, yellow needle arm, yellow sliding On/Off switch, a round yellow wind-up knob on the front, and a yellow carrying handle on the back for portability. The record player has a hidden compartment on the back that stores 5 accessory records. The sides of the player have red paper lithographs with yellow designs. The lithographs are often torn or missing. *See "Variations" below. #3 - London bridge - Oh where has my little dog gone? FPT44991 - Uses 1 Litho (x2 - same one on each side): The lithographs feature Humpty Dumpty in top left corner and are marked "995, MUSICAL MOVEMENT MADE IN SWITZERLAND, PAT. PENDING, ©'71 FISHER•PRICE TOYS, EAST AURORA, N.Y., MADE IN U.S.A.". FPT44992 - Uses 1 Litho (x2 - same one on each side): The lithographs feature Humpty Dumpty in top left corner and are marked "995, MUSICAL MOVEMENT MADE IN JAPAN, PAT. PENDING, ©'71 FISHER•PRICE TOYS, EAST AURORA, N.Y., MADE IN U.S.A.". FPT44942 - Litho #1 has a bird on each end. Litho #2 has a bird on one end and 2 big flowers on other end. Both lithos are marked "995, MUSICAL MOVEMENT MADE IN SWITZERLAND, PAT. PENDING, ©'71 FISHER•PRICE TOYS, EAST AURORA, N.Y., MADE IN U.S.A.". FPT44944 - Uses 1 Litho (x2 - same one on each side): The lithographs are marked "995, MUSICAL MOVEMENT MADE IN JAPAN, PAT. PENDING, ©'71 FISHER•PRICE TOYS, EAST AURORA, N.Y., MADE IN U.S.A.". FPT3438 - Uses 1 Litho (x2 - same one on each side): The lithographs are marked "995, MUSICAL MOVEMENT MADE IN SWITZERLAND, U.S. PAT. NO 3,710,668, DES. PAT D229,547, ©'71 FISHER•PRICE TOYS, EAST AURORA, N.Y., MADE IN U.S.A.". FPT44945 - Uses 1 Litho (x2 - same one on each side): The lithographs are marked "995, MUSICAL MOVEMENT MADE IN JAPAN, U.S. PAT. NO 3,710,668, DES. PAT D229,547, ©'71 FISHER•PRICE TOYS, EAST AURORA, N.Y., MADE IN U.S.A.". FPT44943 - Uses 1 Litho (x2 - same one on each side): The lithographs are marked "995, MUSICAL MOVEMENT MADE IN SWITZERLAND, (no patent info), ©'71 FISHER•PRICE TOYS, DIVISION ON THE QUAKER OATS CO". FPT44946 - Uses 1 Litho (x2 - same one on each side): The lithographs are marked "995, MUSICAL MOVEMENT MADE IN JAPAN, (no patent info), ©'71 FISHER•PRICE TOYS, DIVISION ON THE QUAKER OATS CO". FPT44941 - The lithographs are NOT marked. Has a hinged flap to cover the record storage compartment. Bottom of the player has a battery cover/compartment and requires 3 AA-size batteries to operate. FPT937 - Dark blue plastic record marked "#1 - Humpty Dumpty - Jack and Jill". FPT940 - Dark blue plastic record marked "#2 - Twinkle twinkle little star - Au clair de la lune". FPT20343 - Dark blue plastic record marked "#3 - London bridge - Oh where has my little dog gone?". FPT20344 - Dark blue plastic record marked "#4 - Camptown races - Children's marching song". FPT946 - Dark blue plastic record marked "#5 - Hickory dickory doc - Edelweiss". FPT20345 - Blue (Turquoise) plastic record marked "#1 - Humpty Dumpty - Jack and Jill". FPT20346 - Blue (Turquoise) plastic record marked "#2 - Twinkle twinkle little star - Au clair de la lune". FPT20347 - Blue (Turquoise) plastic record marked "#3 - London bridge - Oh where has my little dog gone?". FPT20348 - Blue (Turquoise) plastic record marked "#4 - Camptown races - Children's marching song". FPT20349 - Blue (Turquoise) plastic record marked "#5 - Hickory dickory doc - Edelweiss". FPT17134 - Green plastic record marked "#1 - Humpty Dumpty - Jack and Jill". FPT20350 - Green plastic record marked "#2 - Twinkle twinkle little star - Au clair de la lune". FPT17135 - Green plastic record marked "#3 - London bridge - Oh where has my little dog gone?". FPT944 - Green plastic record marked "#4 - Camptown races - Children's marching song". FPT945 - Green plastic record marked "#5 - Hickory dickory doc - Edelweiss". FPT938 - Orange plastic record marked "#1 - Humpty Dumpty - Jack and Jill". FPT20351 - Orange plastic record marked "#2 - Twinkle twinkle little star - Au clair de la lune". FPT20352 - Orange plastic record marked "#3 - London bridge - Oh where has my little dog gone?". FPT943 - Orange plastic record marked "#4 - Camptown races - Children's marching song". FPT20353 - Orange plastic record marked "#5 - Hickory dickory doc - Edelweiss". FPT20354 - Light purple plastic record marked "#1 - Humpty Dumpty - Jack and Jill". FPT8533 - Light purple plastic record marked "#2 - Twinkle twinkle little star - Au clair de la lune". FPT942 - Light purple plastic record marked "#3 - London bridge - Oh where has my little dog gone?". FPT20355 - Light purple plastic record marked "#4 - Camptown races - Children's marching song". FPT17133 - Light purple plastic record marked "#5 - Hickory dickory doc - Edelweiss". Repair: If your record player runs slow (or not at all! ), you may want to check out our REPAIR STATION. 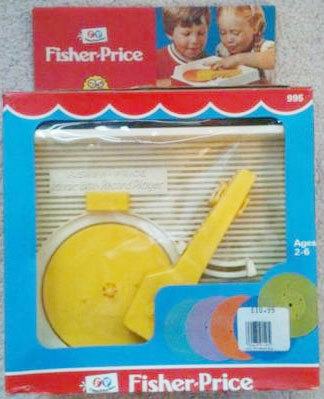 We can restore most Fisher-Price record player mechanisms to almost new condition!